There are over 400 members in the congregation of the Unitarian Universalist Church of Sarasota, each of whom believes in a liberal theology meaning we are united by shared values, not by creed or dogma. This is a place that helps people connect to one another. We have a community where people care for one another, where they show up for one another, a strong, vibrant community that helps us contribute to society. What shines through in everything we do is that people here truly love each other. Look at all the rides to the doctor, the casseroles when we’re sick, the buzz on Sunday mornings, the large number of social groups. It’s a place where people care for each other, where they care about making connections with one another. It’s a place where you will be cared for as you care for others, where you can build a support group to rely on. 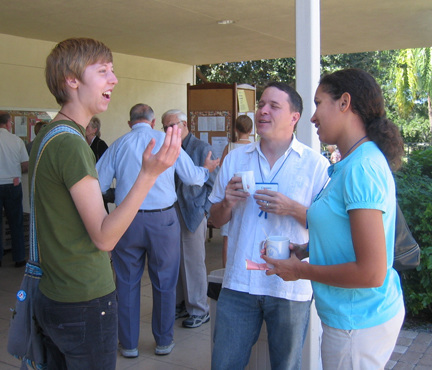 As a congregation we are older than average (75% of our members are over 60) and very well-educated. 82% of our members hold bachelors degrees and more than half hold graduate degrees. Eleven percent hold doctorates. We are a very active and involved congregation with 63% of our members attending Sunday service three or four times a month. More than 70% of us perform volunteer work in the church in a typical month and 32% contribute more than five hours a month. One of the distinguishing hallmarks of our congregation is our 65-year history of expressing our values in action, through social concerns and community outreach. Currently, we are in the forefront in addressing housing issues. The vast majority of our members describe themselves in multiple religious terms. The largest number of members (57%) describe themselves as identifying with humanists, followed by eclectic (44%), ethical religion (44%), agnosticism (35%), ethical Christianity (26%). Despite our diversity of religious outlook and expression we are united in our conviction that we can make a difference in our community and that we should witness for our faith in doing so. Person for person you’d be hard pressed to find a group of individuals more aware of important issues or more engages in addressing them. In fact, whenever there is a disadvantaged or disenfranchised group in Sarasota you can be almost certain that a member of our church is at the forefront of helping. Often that leads to involvement of the larger church, sometimes as the only faith-based community involved. Our people have a sense of their own worth and the value of their community. There are so many useful things here you can do for society and for this community.